Downtown style mavens and music celebs like Jordin Sparks converged on the launch of Dots Style & Beats Wednesday night for a fashion face-off. Stylists, designers like Richie Rich and Anne Bowen were among the party-goers sipping Effen Vodka and nibbling on cupcakes. Documenting the festivities was Rocco Leo Gaglioti of Fashion News Live. Guests were handed sparkly 'dots' and directed to browse the racks of the Dots collection to choose their favorite styles. Dots is a retailer that knocks out tons of trendy, ridiculously affordable clothes. The turnover is high to keep the looks fresh. 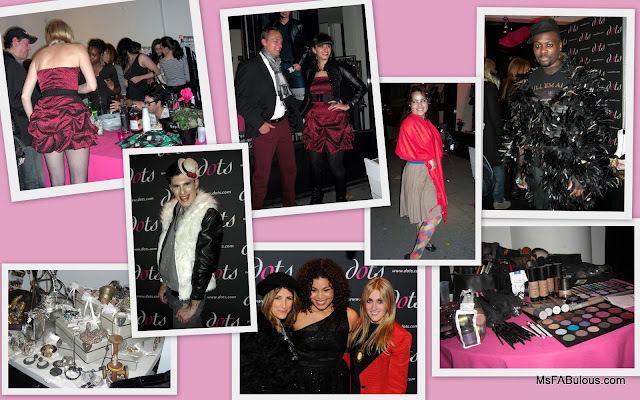 Independent designers like Cora, Islaet, Ivan Helsinki, Steel Pony, Vu, accessories by Cleo & Cat, Clara Kasavina and Eileen Gural showed off their wares for the holiday at the event. Stylists from Brow-NY to help glam and pamper guests onsite.